New puppy! Oh, and some awesome peppers. 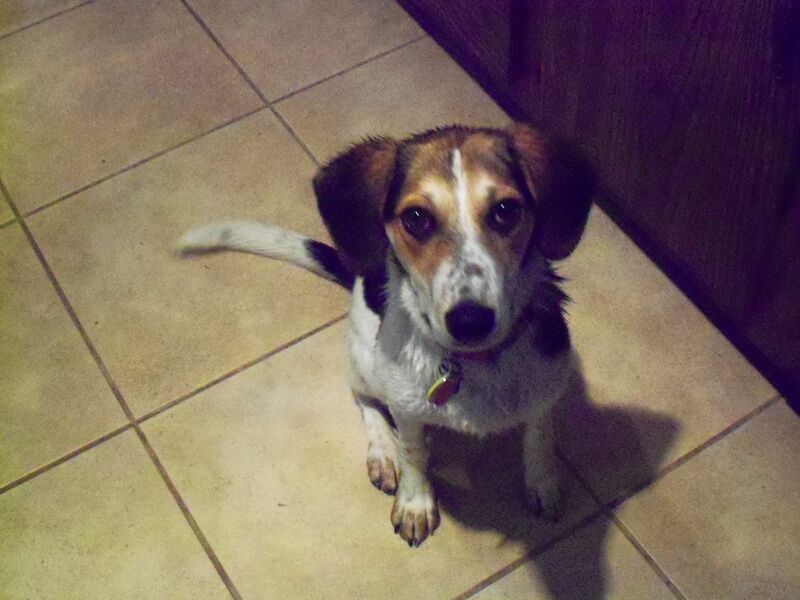 Last May we adopted a five-month-old beagle mix and named her Cleo. She had been born in a shelter, and was labeled “special needs” for her debilitating shyness: she was frightened by everything except other dogs. Nearly a year later, she’s still a little cautious around new people (especially men) but all her other fears have vanished, except for one: she’s terrified of being left home alone, even for a few minutes. After trying everything we could think of with no success whatsoever, we took the advice of experts and adopted a second dog. What we wanted was a dog who was Cleo’s size (38 lbs.) or a little smaller, and her age (16 months) or a little younger. What we got was Libby, a lab mix who’s older (at 2 years) and considerably larger (54 lbs.) than Cleo. But Libby is perfect in every other way. She and Cleo play like long-lost sisters, and despite Libby’s advantage in age and size, she lets Cleo take the lead. Cleo has never met a dog she didn’t like; Libby loves all dogs AND all humans. Cleo’s better trained (so far), but Libby’s more eager to please. They’re both smart and very fast learners. Amazingly, we can leave them home alone without Cleo destroying the house or injuring herself. Best of all, Libby is very affectionate and easy to love. We’ve never had two dogs at once. Libby was on loan to us this weekend from a foster family, so we had a few days to decide whether this was right. I was wide awake at 3 a.m., thinking of all the challenges to having two dogs: How do we fit them, us, and suitcases in the car if we go away for the weekend? How does little ole me (at 5’1″) take two strong, rambunctious dogs on a walk—or anywhere at all—on my own? (Yeah, I know, with massive training, but until then?) Can we fit over 90 lbs. worth of combined puppy energy in our house? But then I woke up and saw those happy girls grinning and thumping their tails, and the worries faded in comparison to the bounty of canine love. At this moment, the girls are romping around the living room. We just had our first road trip: a mixed success. We spent a small fortune on supplies we hadn’t realized we’d need. All in a day’s work. Enough about canines, and back to food. Our grocery store started carrying these miniature beauties about a year ago, and we’ve been having a field day with them. 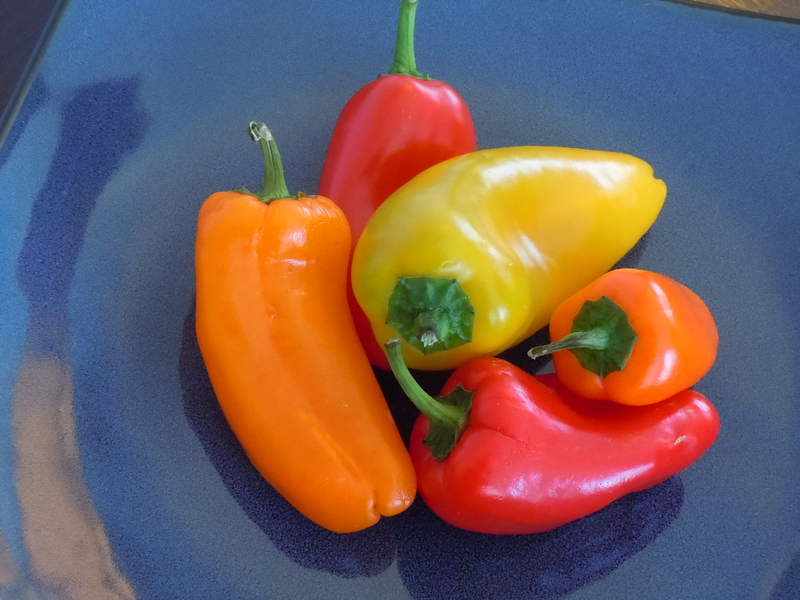 The peppers are very sweet, with little or no heat, and come in an assortment of red, orange, and yellow. They are shaped like elongated bell peppers but range in size from an inch to three inches long. We often plan to make these delicious bites when we have some leftover risotto on hand, as the creamy texture holds together well when packed into the peppers. Sometimes I just make a small batch of pilaf or orzo, stir in some cream cheese or goat cheese and maybe a few tablespoons of pesto or a bit of chopped cooked spinach for color and flavor. 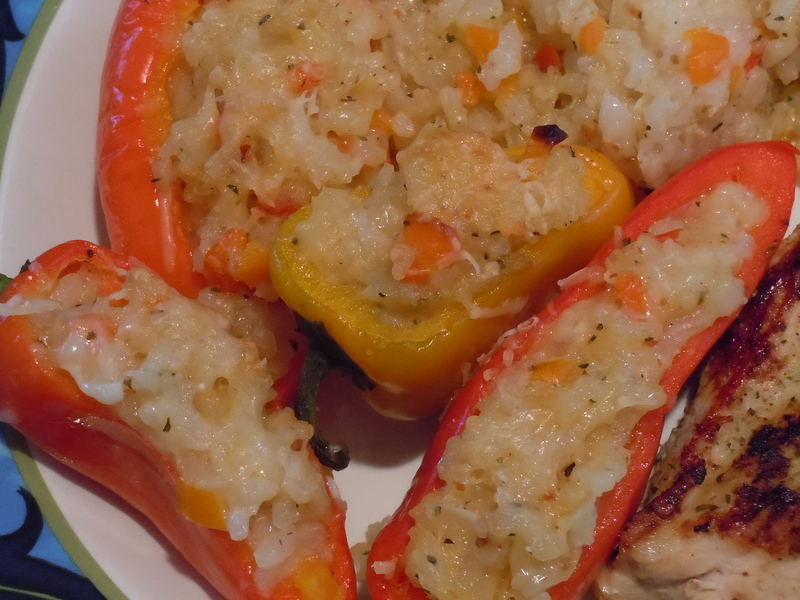 We like the texture that rice imparts, but the peppers are scrumptious with just a little creamy cheese mixed with some herbs. This makes for some darn pretty appetizers, by the way. You can also mince the trimmings from the mini peppers, sauté them in a little olive oil with some shallots, and stir them into the filling. Why let all that sweetness go to waste? Of course, you can do what I usually do, and just eat the trimmings as you prepare the dish. You can split the peppers in half lengthwise, but I find the filling tends to fall out, so I just lay each pepper on its side and cut a slice off. There aren’t many seeds and they’re all at the top just under the stem, so they’re easy to pop out with your fingers. I also leave the stems on, which helps to keep the veg from falling apart. The recipe will make enough for four side dishes. Preheat oven to 375°F. Trim a slice off of each pepper and scrape out the seeds. Gently pry the peppers open a little bit. 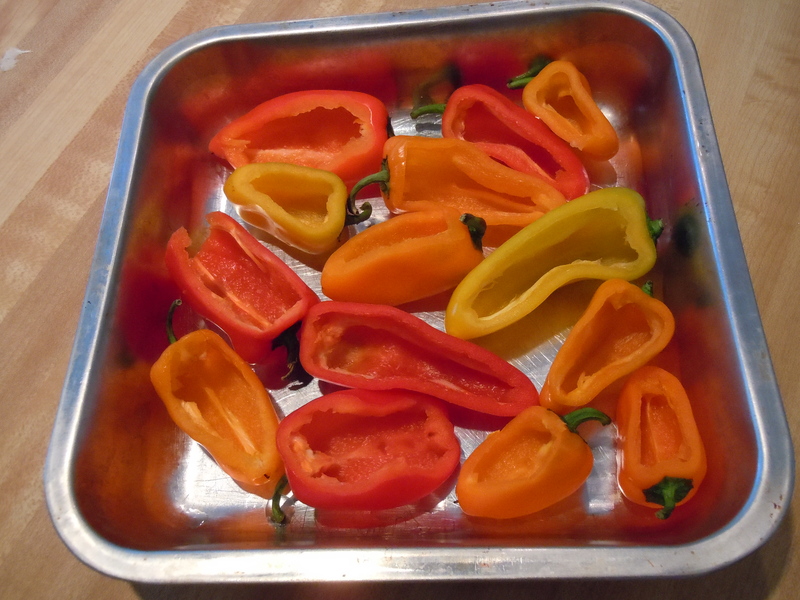 Lay the peppers flat, openings facing up, in a baking dish just large enough to hold them in one layer. In a small bowl mix together the rice, cheese, and ½ cup of the parmesan. Add a tablespoon or two of chicken stock if the rice mixture is too stiff. Taste and adjust seasoning. Stuff each pepper with the rice, mounding a little extra rice on top. Pour about ¼ cup stock in the pan around the peppers—just enough to not quite cover the bottom of the pan. Sprinkle the remaining parmesan over the peppers. Bake for 20 to 30 minutes, until the peppers are tender and the filling is bubbly and browned. This entry was posted in appetizers, pasta, rice, and grains, sides, veggies and tagged cheese, chiles, cream cheese, goat cheese, mini peppers, orzo, parmesan, peppers, rice, rice pilaf, risotto, stuffed peppers. Bookmark the permalink. 5 Responses to New puppy! Oh, and some awesome peppers. Nice work! The peppers look delicious…I will have to try them out…not sure Christian will eat peppers yet. Barkly after our move to Colorado…but we never got the second dog to keep him company…it probably would have helped! Thanks, Jill! Is Christian a picky eater, or is he just pepper-averse? He can always eat the filling out of the peppers, and pass the best part—the peppers—on to you guys.